Place penne pasta in a large pot of boiling water. Cover and simmer for 10 – 12 minutes until it is slightly underdone. Drain pasta. Chop up the fresh basil. 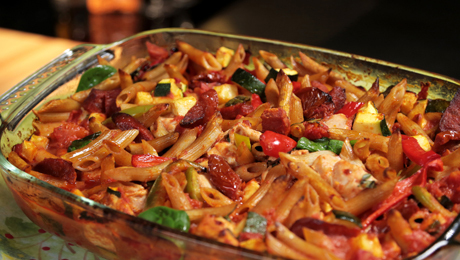 To an ovenproof casserole dish, add chicken, vegetables, sun dried tomatoes, pesto, chopped tomato, basil and chorizo. Mix well, gently stir in pasta. Cover with aluminium foil and place in oven and cook for 45 - 60 minutes until chicken is cooked through. Remove foil and cook for a further 10 minutes for a crispy top.